Every time you wake up, you relive the same night over and over. Written by Avian Michel on January 27th, 2019. 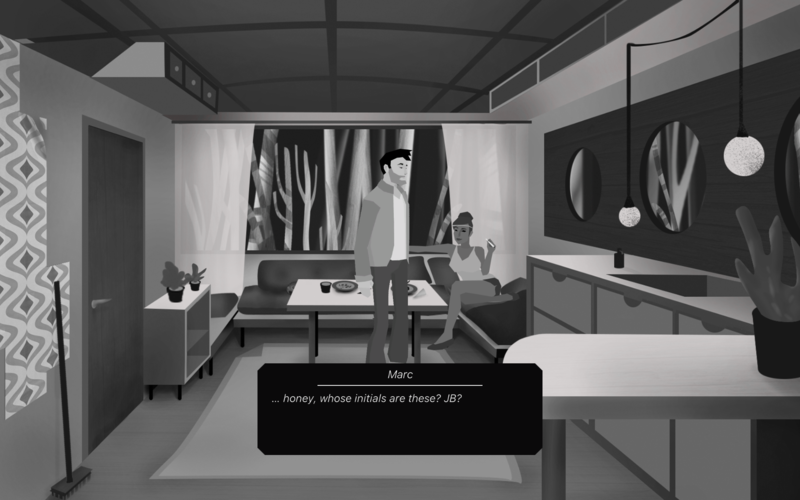 AWAKE – Definitive Edition is a 2D point-and-click adventure game developed by Storyyeller Games and Off The Beaten Track, and published by Schreihals Interactive. 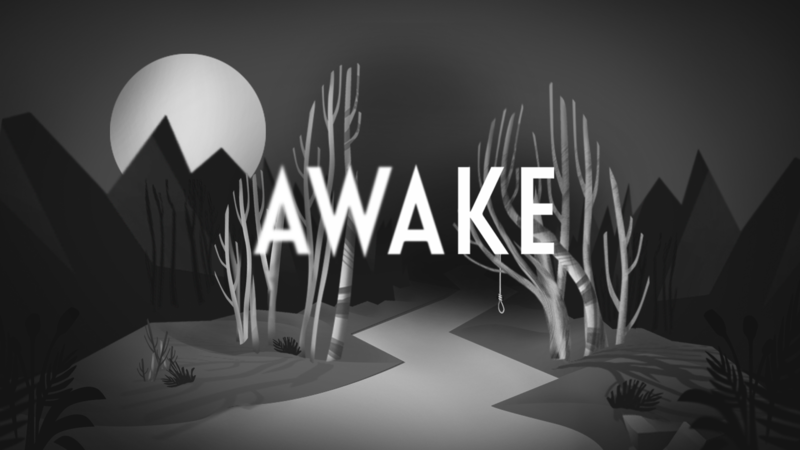 It was originally known simply as AWAKE, which was created for Adventure Jam 2016. AWAKE – Definitive Edition polishes up the rougher mechanics of AWAKE (2016) and expands the game to multiple platforms. It is described as a short game “about as long as a movie” that should be played straight through in one sitting, and is currently available for PC, iPhone, and Android. Awake features a simplistic story that is easy to grasp. 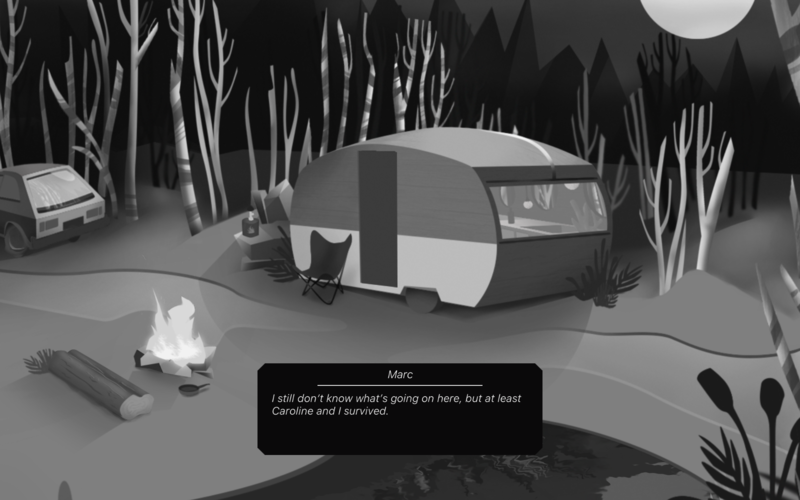 The player controls Marc, who is on a camping trip in the wilderness with his girlfriend Caroline. During the night, you are sedated, kidnapped, and drowned by a mysterious third person. After every death, Marc wakes up again in his camper with Caroline, and has to live through the same night over again. Marc can collect objects around him and use them to potentially change his fate: the goal, of course, is to survive the night. The first of many deaths to come. It’s worth mentioning that Awake’s original form from 2016 was created in a two-week timespan in Adventure Jam, which is an event of the “game jam/hackathon” category where creators race to create entirely new projects within the event’s duration. For a product of only two weeks, AWAKE (2016) is an extremely well-made game, and it’s easy to see why it was awarded Judge’s Pick during the event. AWAKE (2016) features full voice acting, detailed graphics and artwork, and multiple story paths to endgame; all of these traits are carried into AWAKE – Definitive Edition. Main differences between AWAKE (2016) and AWAKE – Definitive Edition include changed gameplay mechanics and improved graphics. One major difference between Awake (2016) and Awake – Definitive Edition is dynamic water reflection. For the almost three years between May 2016 and January 2019, there has not been much, if anything, added to the game’s story. The story progression makes it so that when Marc manages to foil the killer’s first plan, the killer ends up committing the murder in a different way. However, this strategy of altering the murder plot doesn’t last long enough to create an established pattern. The endgame is reached rather quickly (though this is addressed with the game’s length, it leaves much to be wanted). Surviving the night doesn’t feel like a satisfying resolution, either. Marc simply states, “I don’t know what’s going on… but nothing will ever be the same.” Both Marc and the player are still left in the dark as to what happens the morning after, or what has even happened to the killer. Certain choices during Awake hint to the killer’s identity and motive, but while this begs for further story and character development, it is never actually explored. The killer could be an actual character equal to Marc and Caroline, but is instead treated as a plot device or a random stranger. It’s possible to play through and finish the game without ever encountering this line about the mysterious JB. Along with an ambiguous ending, Awake also features different ways to foil the murder plot and end the game. However, these choices don’t actually feel distinct from one another as they all carry out the same event. The difference between playthroughs is merely the combination of objects/actions used to trigger the ending. What is the difference between carrying a lighter or a flashlight, or tripping over a taut rope versus a loose plank? The only reason to try out different item combinations is to earn the 11 in-game Steam achievements. This is the ending scene of Awake. It makes as much sense now as it does in context. 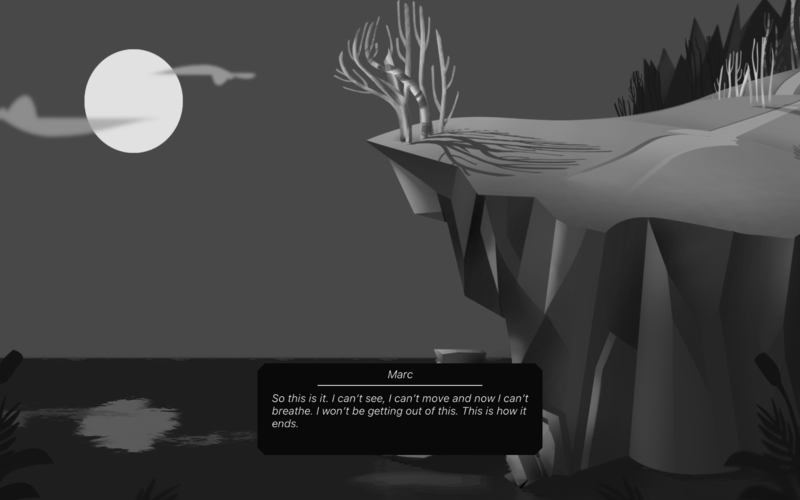 Awake is a short, thoughtful game that fills up about an hour, and I really do have to applaud the game devs for creating something like this from scratch to finish in two weeks. However, the success of AWAKE (2016) begs for more content, not simply revamped graphics and gameplay mechanics. There is huge potential in this game, but I don’t feel like it’s been explored enough — especially considering the time gap between Awake’s initial version and this definitive edition. Game development team Off the Beaten Track likes to continuously pump out successful games in various game jams, but I’m looking forward to something that is fully fleshed out, and right now Awake isn’t filling those shoes. 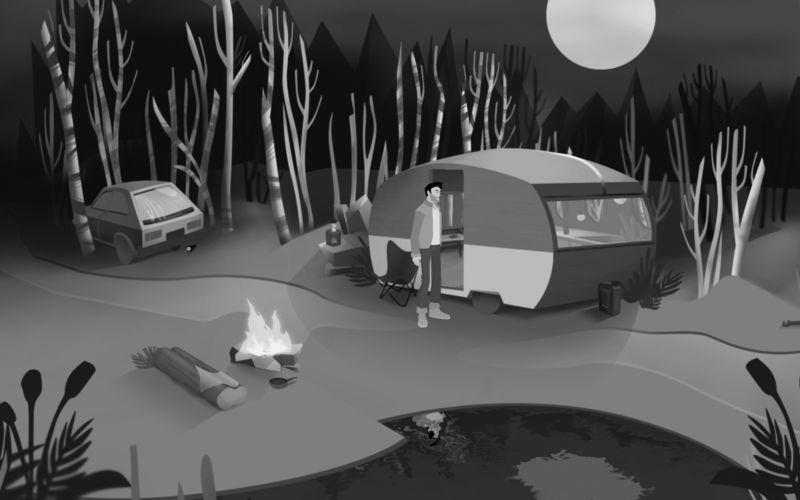 Graphics: Artwork is intricate while still keeping a polygonal style. Water in-game is updated from AWAKE (2016) to have dynamic reflections. Sound: Music and full voice acting help build the environment in Awake. Story: The story has a great premise but falls short on delivery. There is much more potential waiting if the plot had been further explored. Progression: Deaths are quite obviously repetitive, but the puzzles take a short time to solve. Replay Value: The ending leaves players wondering what they may have missed in-game, but even unlocking all achievements doesn't serve to make more sense of the vague ending. Players will replay if only from dissatisfaction from the first playthrough. Final Rating: 6/10. Great for 2 weeks. Not great for 3 years. And yet, nothing will ever be the same. Michel "Avian" N. (they/them/their pronouns) is an aspiring YouTuber and content creator whose hobbies include editing videos, playing instruments, writing, and gaming. They firmly believe that gaming is a form of art in its own right — interpreting media is generative and creative. Avian's tastes range wildly, but their favorite games are osu! and Black Desert Online.